Today has been a busy but productive day. I went grocery shopping, had a lot of patient charts to type, put dinner together and threw it in the Crockpot, and cleaned the whole house. I even cleaned those annoying spots that I usually skip over - like underneath the toaster, the top of the DVD player, and the floor molding in the bathroom. So I am finally now sitting down to my cup of coffee for the day. We aren't eating dinner until 7 and my peanut butter and apple from lunch is struggling to keep me satisfied, so I decided to add a muffin to my cup of coffee. One of the rules of our household is that we always have muffins on hand. 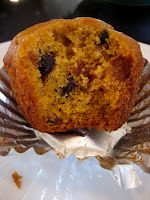 The muffins for this week are pumpkin chocolate chip. Yes, we eat pumpkin muffins beyond Thanksgiving. Some of you may remember the pumpkin shortage we experienced early last fall. For all of you who don't believe it, yes, it really happened. Stores were without canned pumpkin, so people reverted to selling their own canned pumpkin on eBay for $35. It was a tough time. So when I was finally able to find it back on the shelves, I went a little crazy and stocked up. Three months later I'm trying to use it up to make room in my cabinets for other canned foods. 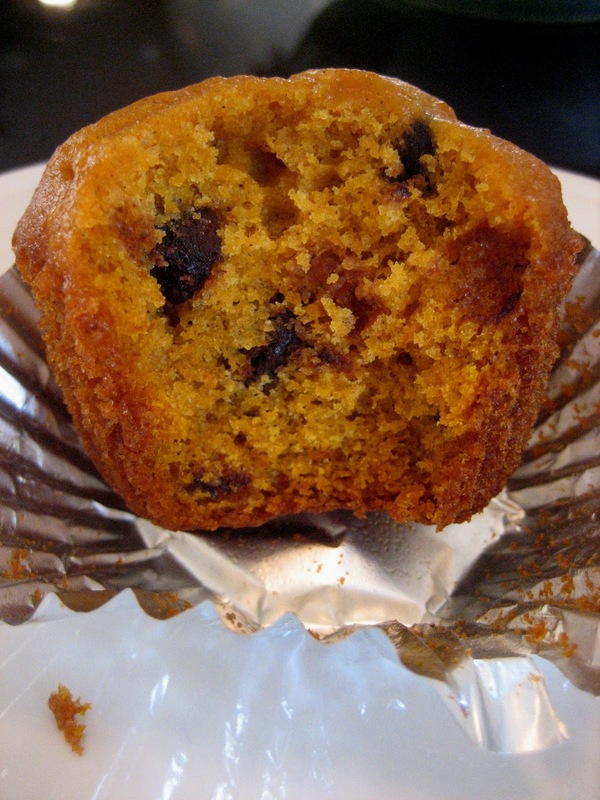 But no worries, because my mother-in-law's pumpkin chocolate chip muffin recipe is a favorite. In large mixing bowl, beat eggs, sugar, pumpkin, and oil until smooth. Combine dry ingredients; add to pumpkin mixture. Mix well. Fold in chocolate chips. Fill greased or paper-lined muffin cups 3/4 full. Bake at 375 degrees for 21-29 minutes or until just starting to darken. Cool briefly before removing from pain. Makes 2 1/2 - 3 dozen. Now a comment about the coffee I am drinking: my friend Aimee gave us a bag of coffee for Christmas. It's coffee from Gobena, a ministry that invests 100% of their net profits from coffee into the lives of orphan children around the world through charity programs, such as Lifesong. Purchasing just one bag of coffee supports an orphan for an entire month. It is good coffee, and it's such an easy way to feed an orphan in Ethiopia. oh yes...the pumpkin shortage...so glad we made it through those tough times! Sherri, you are wonderful! I loved seeing Gobena on here.